One of the most significant announcements coming out of the Google I / O developers conference this past May was the launch of Android Apps for Chrome. While this announcement didn't make the headlines of the conference, it has significant implications for educators and the classroom. An early release of the Google Play Store for Chrome was expected to come to three devices in June: the Asus Flip, Acer R11, and Chromebook Pixel. As of this post, only the Asus flip has received access. The Google Play Store for Chrome can currently only be accessed by switching to v. 53 of Chrome which is currently in developer preview. The developer release channel is used to test out new features however it is fairly unstable and not for the faint of heart. This progression seems to be delayed, however, as not all of the selected devices have been updated to v. 53. At this point, it is unknown if Android for Chrome will be released prior to the start of the 2016-17 school year. It seems unlikely. I have had an opportunity to test out some Android Apps on my Asus Flip Chromebook. The experience is interesting as it is a bit weird to be accessing The Google Play Store on laptop. I am super excited about having access to new tools that were previously unavailable on Chromebooks (e.g. Adobe Creative Suite, Skype, and Minecraft). Android Apps do not load in a new tab like Chrome Apps do. Instead, they open in a floating window roughly the size and dimensions of a mobile phone. While this floating window can be expanded, the visuals do not always support full screen mode. Android Apps can't be docked into the Chrome browser, pinned, etc. One interesting thing to note is that at this time, Google Play does not support account switching. I log into my Chromebooks using a Gmail account, but typically work within my Google Apps for Education account. The Google Play Store recognizes my Gmail account and will not allow me to switch to a secondary account; something that I can do on my phone or if I visit the Play store via the Chrome browser. Not all Chromebooks will support Android Apps. Generally, devices purchased within the last 2 years will be compatible. A list of supported devices is available here. The best thing about Android for Chrome is that App developers don’t have to do anything to make their app compatible with Chromebooks. Interoperability is automatic. This is a vast improvement over past attempts by Google to integrate Android and Chrome as they all required modifications for apps to run on a Chromebook. 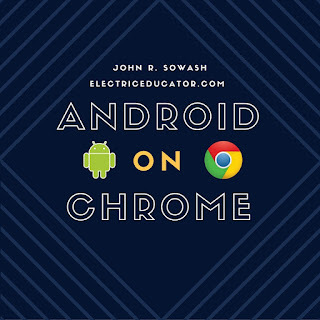 Why should educators care about Android on Chrome? More Quality Apps Available - there are over 2 million Android apps. Increased Touch-screen capabilities - touch-screen is the future of all devices however many web apps are not [currently] touch optimized. Touch optimized apps are easier for younger students to use and are great for math and science classrooms. Increased developer focus - If it is easy to make your Android app run on the 10 million Chromebooks in schools around the world, developers will create NEW tools for the classroom. There are more Android developers than web app developers. Access to previously unavailable tools - There are many tools that are NOT currently web-optimized and can't be run on a Chromebook. Adobe Creative suite, Skype, and Minecraft are three popular examples. These titles DO have Android apps. Increased offline capabilities - While Chromebooks are designed to run on the web, there are still many students who do NOT have web access at home. Android apps are built with offline capacity, making them helpful tools when not connected to the web. While the availability of Android on Chrome opens up lots of exciting possibilities, there are quite a few unanswered questions. Administrative Controls - There are lots of Android apps that are not classroom appropriate. 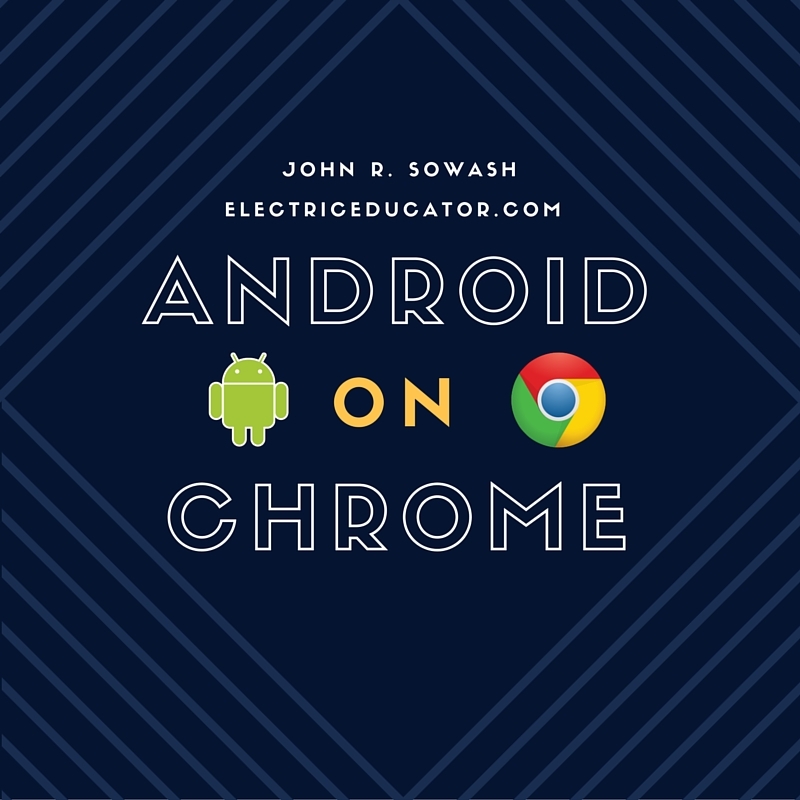 How will district administrators manage Android apps on Chrome? We don't know. Will it similar to Chrome App management? Similar to the old Google Play for Education? Paid Apps - There are also far more paid apps for Android than there are for Chrome OS. Overall, I think that paid apps are fine. I would rather pay for a quality app than deal with lousy, free apps. However, there needs to be a very simple method for schools to purchase and deploy paid content. Google Play for Education was outstanding (schools could pay via PO and distribute apps via Google Groups) and I hope the same features are made available. App compatibility - Not all apps are compatible with Chromebooks. There are a few that will not work, but I don't know why. We need a greater understanding of the specs required to run Android apps. App Overload / Overlap - Instructional coaches and technologists will need to begin thinking about "app overload syndrome". There are so many different ways to get apps now - Chrome Webstore, Google Play, Drive Apps, Drive Add-ons, regular websites etc. How does a teacher decide if she should visit mindmeister.com, install Mindmeister for Chrome, Android or the Docs Add-on? There is a really possibility of increased confusion and frustration with the many different channels that are available for classroom content. Have you had an opportunity to play with Android on Chrome? What are you initial thoughts? Don't have access yet? What questions would you like answered? Thanks for your review and screenshots at the start of the Android/Chromebook adventure. 1. Will Chromebook manufacturers get us those touchscreen choices in time for the start of this 2016-17 school year.. and keep those great Chromebook pricepoints in check..
2. What will be the real specs needed to run Android Apps smoothly.. will all machines need minimum 4Gb RAM and 32Gb.. or be processor dependent for the best experience including graphics resolutions and graphics processing speeds... over the next two to three year unit lifetime..
3. One of the best Chromebook features has been the ability to jump from device to device, as well as sign in on PC and MACs with Chrome browser to get a similar experience.. how will this be changing..
4. Will having more Android Apps on board an account affect the ease of sign-in, and fast start-up of Chromebooks. I agree that Teacher/Technologist App/Overload/Overlap will truly be an issue. "Extension? App? Android App? Play? Game Store? where? how? for all access or just some machines? some Chrome installs or just Chromebooks? not that Tablet you set me up with? :) and where did you tell me my Photos are stored now?" Thanks again for your first review! I am still a 100% Chromebook and GAFE fan. There are more and more touch-enabled Chromebooks coming out each quarter. Most new devices coming out have touch and non-touch versions. All of my ChromeOS devices are touch and I can't imagine going back. I would strongly discourage anyone from purchasing a Chromebook with less than 4GB or RAM. I wish there were more devices that offered 8GB as an option. I'm not sure how Chrome Sync will be impacted by Android Apps. It's a great question. The Android apps are much larger than Chrome Apps and might cause issues if automatically downloaded to new devices. I haven't noticed any performance issues on the Asus flip now that I have Android Apps on them; boots just like normal. I've been playing around. So far many of the photo/video apps aren't working, but games like Minecraft PE are. Really looking forward for future iterations of the Chromebook that include rear-facing cameras, accelerometers, and other components. BTW, really loving Google Cast for Education. Same here; I can't get Photoshop to work at all. Keeps crashing. I'm not sure what will happen with apps that require the accelerometer / gyroscope. For now, I'm guessing they won't be compatible with Chromebooks. It's mostly just a shell, sort of an agenda of what I want to show in the editor. You make some good comments here. Some other things that come to mind. Will the app curation features that were available in GP4E be available? All other Google Apps are deployed using OU's Are these apps going to use Groups or even Classrooms because OU's don't work for paid apps ! As you say its getting confusing. Hey Clive. Not sure how Android app permissioning will work. If it works the way that Gp4E was configured, app purchases and deployment was done via Google Groups or individual users, kind of like sharing a Google Doc. Just an FYI on hardware specs.... I was told at ISTE by a Google rep that the Android apps are lightening fast on the Chromebooks. He said.... think about it, these apps are designed to run on phones with much slower processors, etc.... I guess that makes sense. That would be !Super! if true! I hope Developers keep ease of on board memory and running speed a top priority. Looking forward to seeing some test runs when we can! Best to all - keep the conversation going as news breaks. Thanks for contributing to my blog. I enjoy being a part of the conversation and do my best to respond to comments and questions that are posted. The Electric Educator by John R. Sowash is licensed under a Creative Commons Attribution-Noncommercial-Share Alike 3.0 United States License. Electric Educator © John R. Sowash |. Awesome Inc. theme. Powered by Blogger.